12 unique watches, each of which commemorates the world’s 12 greatest boxers to grace the ring, to be auctioned for WBC charity in Vegas this September. The winners bids will receive their watch from the fighter himself. All proceeds will go to support the charitable initiatives of the World Boxing Council. The oldest sport on record- dating back to 6000BC, “Boxing is the art of fighting with the heart while using the fists,” said WBC, CEO Jose Sulaiman. Hublot has taken the fervour and art of the sport and fused it with the passion and history of the watch world. This synergy has resulted in the creation of 12, unique one-of-a-kind pieces, each of which commemorates one of the greatest boxers to grace the ring including legends, Lennox Lewis, Julio Cesar Chavez, Mike Tyson, Sugar Ray Leonard, George Foreman, Marvalous Marvin Hagler, Tommy Harns, Roberto Duran, Oscar de la Hoya, Evander Holyfield, Jeff Fenech, and Larry Holmes. Jean-Claude Biver, Chairman of Hublot : “Hublot feels proud and privileged to have joined the fight of the legends of this great sport. These twelve unique pieces which are reflecting the "fusion" between the fierce competitors of the historic sport of boxing and the accomplishments of 450 years of Swiss Watch Making Art”. For fans of Boxing and Hublot alike, this is a One-Time opportunity to attend an extraordinary evening with the legends of boxing themselves and/or to acquire a highly exclusive "Knockout" King Power World Boxing Model. This September, Hublot and the World Boxing Council will host a one-time event in Las Vegas that will unite the Champions themselves, not to fight in the ring, but to battle the needs of their constituents. 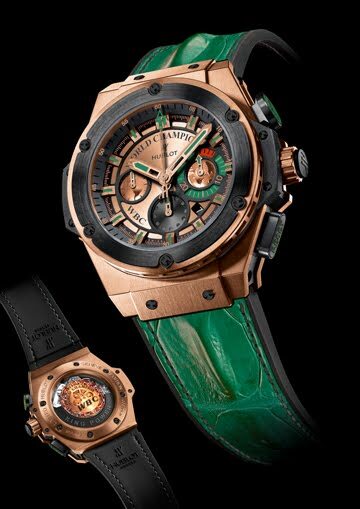 The watches will be pre-sold at an auction beginning in June on a dedicated website (link available at www.hublot.ch or www.worldboxing.com from 1 June 2012). Those individuals with the winning bids will be invited to attend the event and receive their watch from the fighter himself. All proceeds from the sale of each watch will go to support the charitable initiatives of the World Boxing Council including the retired boxer’s pension and emergency funds in over 40 countries around the world.